Take on the mountain adventure of your dreams while raising funds to support the transformative wilderness experiences that BCM provides for under-resourced youth. We offer experiences that are appropriate for all outdoor enthusiasts with a solid foundational level of fitness, regardless of specific climbing or mountaineering skills. Each trip is run by professional guides to ensure you have a great experience. For more information about how the Summit for Someone program supports youth programming at Big City Mountaineers, head to our Frequently Asked Questions page. Welcome to Summit for Someone! Registration for all 2019 adventures is now open – please read on to learn what we have in store for the 2019 season. All registration is on a first-come, first-served basis. 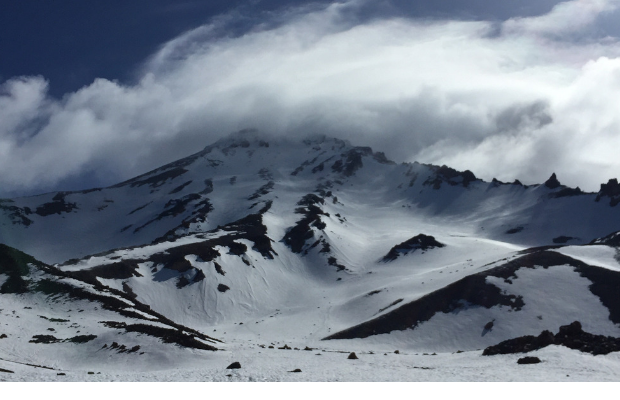 Standing at 11,240’ above the mighty Columbia River, Oregon’s highest peak offers technical climbing routes for the aspiring alpinist and is home to some classic alpine test pieces for the experienced climber. Often noted as the second-most climbed glaciated peak after Mt. Fuji, an ascent of Mt. Hood via the Southside Route is an entry-level technical climb requiring the use of ice axe and crampons. 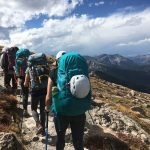 This program is geared for folks with little to no previous mountaineering experience, although a high degree of physical fitness is needed for this climb. With a Steep Snow Climbing Course included in this program itinerary, you’ll be ready for your summit attempt the following day. Guided by Timberline Mountain Guides. Standing just 250 feet shy of Rainier—and towering over 10,000’ above the surrounding topography—Shasta is the second-highest peak in the Cascades (14,179’) and the snowy West Face Route is an excellent climb for mountaineers looking for a beautiful, more remote climb to Shasta’s summit that offers a true wilderness experience. A comparable technical challenge to Avalanche Gulch, the West Face is ideal for new and experienced climbers. 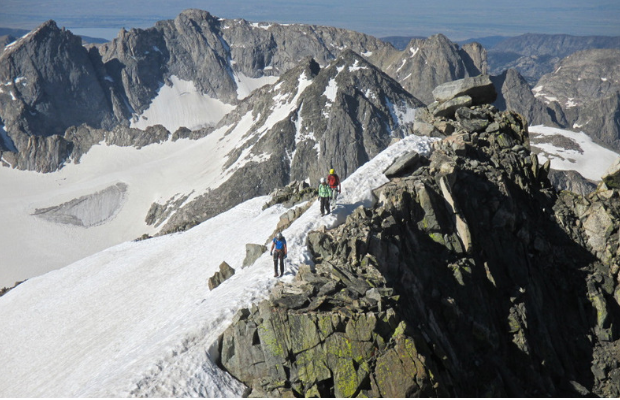 The schedule is alpine style, so good training is essential for reaching the summit. Guided by Shasta Mountain Guides. 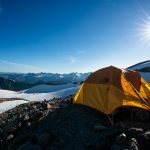 This classic and epic hut-to-hut backpacking trip, timed for beautiful weather, will have you scheming about your next trip back east. 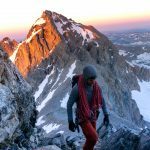 The three-day, 20-mile ridge climb includes summits of Mounts Madison, Adams, Jefferson, Washington, Monroe, Franklin, and Eisenhower, and it’s nearly all above treeline. 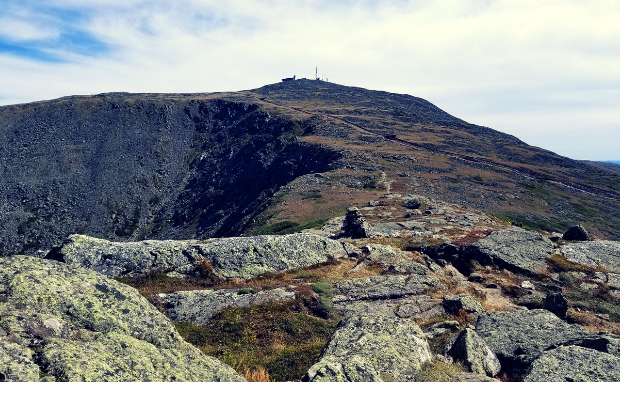 This trek is also an opportunity to check out the Appalachian Mountain Club’s famous hut system, with two nights in these iconic accommodations along the way. A summer Presidential Traverse is a spectacular way to see the wild White Mountain National Forest from above. Guided by Ragged Mountain Guides. 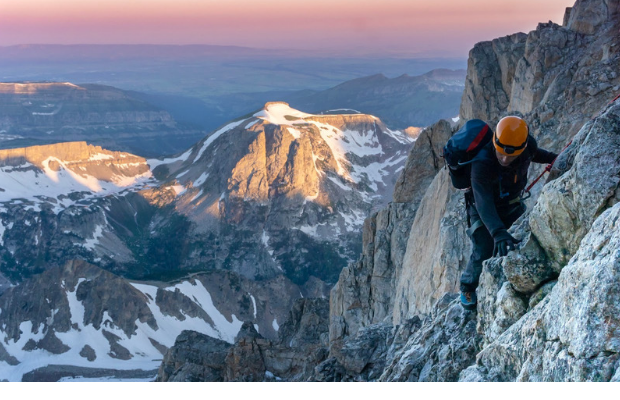 Countless climbers have been drawn to the jagged Teton skyline, and its centerpiece, the aptly named Grand Teton, is the most iconic summit of all. 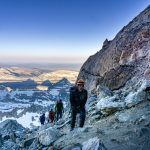 At 13,775 feet, the Grand is a classic mountaineering challenge: the climb covers 14 round-trip miles, 14,000 feet of elevation gain and loss, and plenty of scrambling and technical fifth-class climbing. It’s also in the heart of gorgeous Grand Teton National Park, where you’ll experience the Wild West at its finest—think flower-filled meadows, possible bear sightings, and gnarly, fast-moving weather. 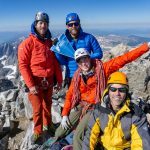 A first stop on many mountaineers’ big mountain bucket list, a Grand Teton climb is an unforgettable experience. Guided by Jackson Hole Mountain Guides. Mt. Shuksan (9127’) is a massive, complex peak which offers abundant learning opportunities for beginner climbers. It is an excellent ascent on diverse terrain, including both glacier travel and a rock scramble to the summit. The Sulphide Glacier route offers good glacier travel and an exhilarating final climb up steep mixed snow and low 5th class rock to the summit pyramid. 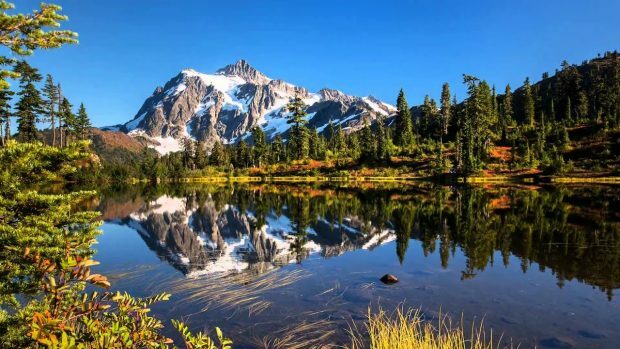 This mountain is exceptionally picturesque and offers a memorable experience in the Cascades, along with a sense of solitude and openness that eludes some of the most popular mountains in the region. Guided by Mountain Madness. This epic and iconic peak truly lives up to its definition as one of the pinnacles of mountaineering glory. 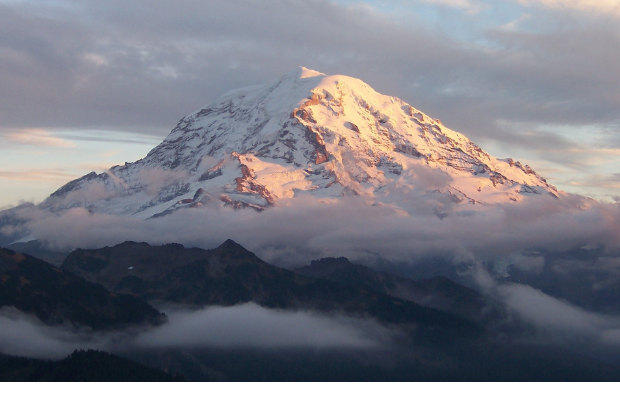 Standing 14,411 feet high, Rainier is the 2nd highest mountain in the lower 48 and tallest peak in Washington. 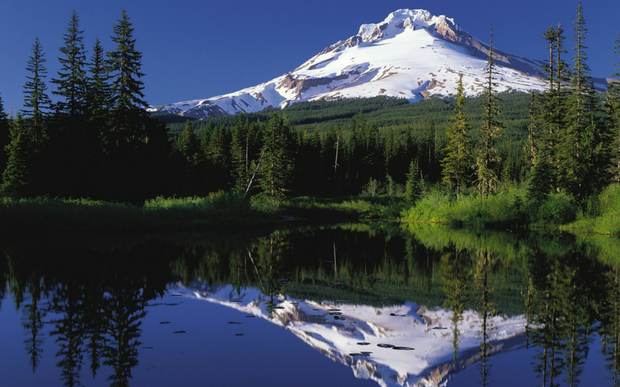 This mountain remains the ultimate goal on many climbers’ bucket lists. 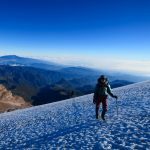 The opportunity to take on this adventure includes a four-day summit attempt of Mount Rainier via the Disappointment Cleaver. Guided by Sierra Mountaineering International. Welcome to the Wind River Mountains of western Wyoming, a massive range spanning 100 miles and home to many 13,000’ glaciated peaks and remote alpine areas. The Wyoming state high point, Gannett Peak, is the 13,804’ crown jewel of this pristine wilderness. Join Chris Warner – accomplished mountaineer, prolific leadership and business educator, and entrepreneur – as he co-leads this dream of an experiential adventure, complete with his accumulated wisdom from decades spent in the worlds of both mountaineering and business. With a horse and wrangler support team to help transport gear from the trailhead to main camp, you’ll enjoy a long, exceptionally beautiful hike deep into the mountains. 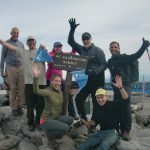 Snow climbing and self-arrest lessons will prepare the group for the summit attempt, a thrilling day that includes glacier crossing, snow travel, and rock scrambling. Time spent together at the end of each day of travel will provide ample time for exploring topics such as leadership, the entrepreneurial spirit, and lessons learned in the great outdoors. Guided by Chris Warner and Jackson Hole Mountain Guides. 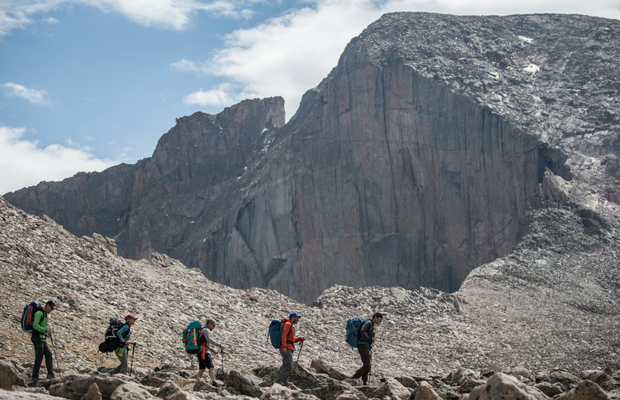 One of Colorado’s best-known Fourteeners—peaks over 14,000 feet above sea level— Longs Peak provides the opportunity to see the Rocky Mountains from one of the most coveted summits in the West. At 14,259 feet above sea level and over 7 miles from the trailhead, this summit will make you earn your views. There are many different routes to the summit; The Cable Route, rising directly from The Boulderfield at 12,500′, is the most direct line to the summit and a historic route that involves a few technical pitches of rock climbing and a few hundred feet of Class 3 rock scrambling. Guided by Colorado Mountain School. Join us for a unique Summit for Someone experience combining a photography workshop with a hiking adventure through the fantastically scenic Great Balsam Mountains of North Carolina. 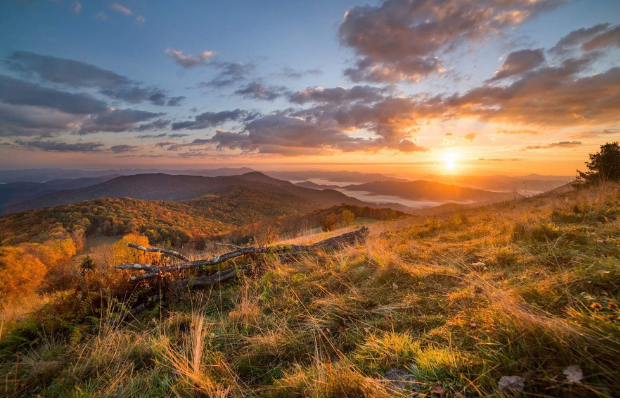 “Focused on Adventure” is an opportunity to immerse yourself in the classic, breathtaking landscapes of the Pisgah National Forest while developing your skills with a camera to help you capture it all. Days will include both sunrise and sunset photography sessions, mountaintop excursions, and plenty of great food and conversation. Guided by Appalachian Adventure Company. At 14,508’, Mt. 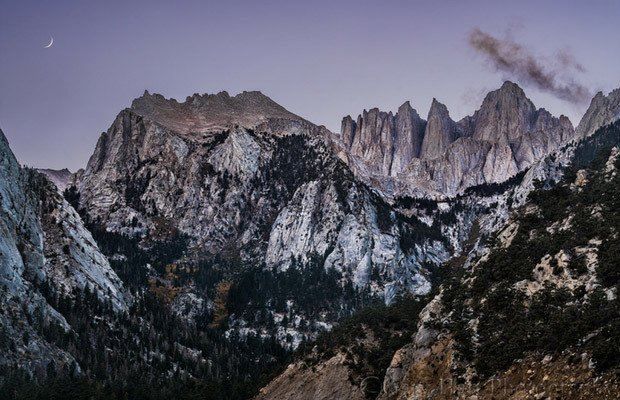 Whitney is the highest peak in the lower 48 states. 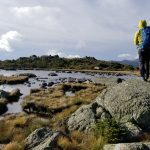 During the summer months, the Mountaineer’s Route offers a beautiful trail past pine trees, boulders, granite slabs, high alpine meadows, and lakes. Located on the northeast side of Mt. Whitney, it includes a chute angled at 25-35 degrees that tops out at a notch about 400 feet below the summit. Here, the angle becomes slightly steeper – 40-45 degrees – to the summit. The terrain is over trails and rock with some interspersed 3rd class climbing requiring the use of hands and feet on good-quality granite, but the terrain is not considered technical in nature. This climb also offers a much less crowded way of reaching this very popular summit, and beautiful vistas are prevalent throughout. Guided by Sierra Mountaineering International. Summit for Someone 2018 was a great success, with many amazing climbs, treks, and trail races. Thanks so much to everyone who participated! 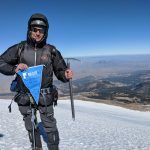 Please check out our 2018 SFS SEASON RECAP to see great photos of our 2018 fundraising adventures and get inspired to join us in 2019. Interested in a different option for fundraising?